So, I decided to count this resolution post for both week’s 1 and 2 of the new year. Mainly because the first week of the new year was only 4 days long… and also because I didn’t try anything new in those few days. For those of you just tuning in… I have posted my 2009 New Year’s Resolutions on the left sidebar. The number one resolution for me is to try a new recipe, food or restaurant EACH WEEK. 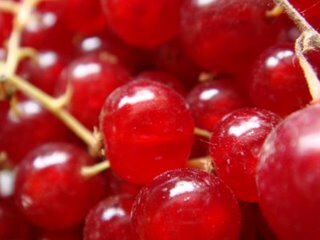 This week, while I was perusing the Cambridge Trader Joe’s, I spied 5.6 oz container of Red Currants ($3.29). Hmm… I’ve had currant-flavored liquor, I have had currant jelly and other current products, BUT… I have never eaten raw currants. SCORE! 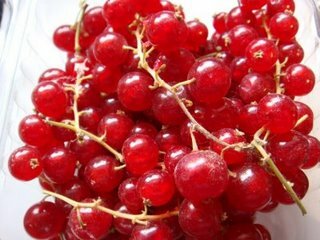 The big bummer of the situation is that “Red Currants” aren’t listed on the 1001 Foods to Eat Before You Die list. So I can’t even cross one of those off… only Black Currants are on the list. I have had those though. Figures! The flavor of the currant is kind of hard to explain. It reminded a little of a gooseberry… but most folks have never had those, so it doesn’t work. They are less tart than I expected. The texture is similar to a blueberry, with little seeds dispersed throughout the medium-soft pulp. They are subtle, delicate, primarily sour and remind me of a mild cranberry. Their flavor holds up well on it’s own… no need to add sugar to sweeten them.They are about the size of champagne grapes and the stem is very delicate like that. I definitely liked them and would probably hesitate to use them in a recipe… I would rather eat them raw. Though, FoodGawker has some delicious looking suggestions.